Pokémon Go was created by the San Francisco-based company Niantic Inc.
San Francisco, with its iconic Golden Gate Bridge and popular Ghiradelli Square, is already a hotbed for tourists this time of year. But these traditional sites aren't the only attractions drawing folks to the city's prominent landmarks this summer: Pikachu is just a big a draw as any. "Pokémon Go," a new geo-caching-like app, has taken over not only the streets of San Francisco, where it was created at Nantic Inc. But it has become a global obsession in a matter of days. The free game (with extras that you have to pay for) is now the country's top-grossing app in the iPhone store just days after its release last week in United States, Australia and New Zealand. Devout gamers are scouring the nooks and crannies of San Francisco, and beyond, in search of beloved Pokémon. "San Francisco almost made me cry tears of liquid gold when I saw all the Pokémon it had," Charlie Lay said in a tweet. 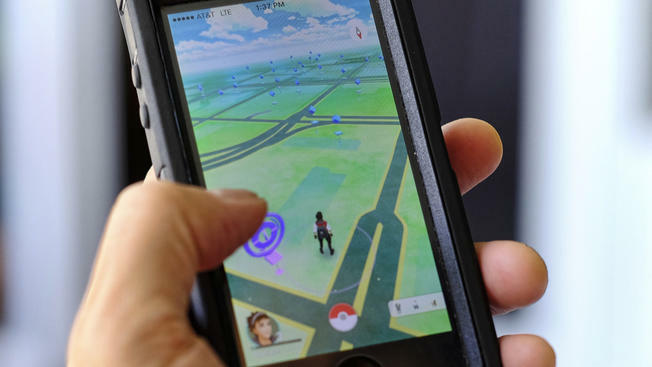 Coined "Pokémon Go," the smart phone game merges virtual gameplay with the physical world. Also known as "augmented reality," players aim their phone at different locations around them - similar to taking a picture - and search for coveted Pokémon characters. It's extremely popular with 30-somethings, who grew up with the card- and video game-version of the game, as well as tweens, discovering the joys of the cute Japanese characters for the very first time. "It's very nostalgic," said Andrew Gulbronson, a big fan of the new game. Folks have taken to the Reddit message boards to acquire intel on where the Pokémon are hanging out in the Bay Area. From BART trains to Golden Gate Park and cross streets in between, the diversity of Pokémon in the city by the Bay has people glued to their smart phone screens. "It's a lot of fun," Gulbronson said. "Been playing a little bit obsessively." Despite being a video game, people are adventuring into the great outdoors and getting active - walking nearly 24 miles in three days in one case - to capture the wide range of Pokémon hiding in the area. Exploring new places has been an added treat for Gulbronson, as well as meeting the hundreds of other gamers that he has run into on the streets. The experience hasn't been all fun and games for some dedicated players. Unsuspecting gamers were robbed by four people in Missouri, according to NBC News. Throughout the country, other gamers have rolled ankles or walked straight into trees while being immersed in their phone screens. It's official: Nidoran loves transit.